The first thing one noticed about Dr Peter Tan was how little he corresponded to one’s pre-conceived image of a linguist: he was decked out in a lemon-yellow long-sleeved shirt and bright salmon-pink pants, his hair tamed in a bun, a smart bow tie crisply completing the look. This unexpected flamboyance was, on second thought, not out of place in a talk about the importance and relevance of style in language: “Style over substance, or style as substance?”. At the heart of this presentation, which opened this year’s ELL Symposium, was the idea that style is not merely a linguistic matter; it pervades many other aspects of our daily lives. Dr Tan, a lecturer at the National University of Singapore, began by discussing the binary opposition of style and thought. Some writers and philosophers have suggested that style is a form of thought subject to adornment, enhanced with a beauty as dressy as Dr Tan’s sartorial choice. For example, Ernest Hemingway’s plain, blunt writing style is reflected in the plain grammatical structure of his sentences and the sparse use of adjectives. In contrast, Oscar Wilde’s prose brims with the dandyish and the fanciful because it delights in the frequent use of metaphors and surprising expressions. Others think that style is inseparable from thought, being part of the way we choose to express ourselves. Our choice of words can radically affect the conveyed mood. Whether we say “I am going to cut my fingernails” or “I am about to excise the excess keratin off the ends of my distal phalanges” surely represents a marked divide in tone. Without seeming to endorse either position, Dr Tan then showed how style is used to perform one’s identity and sense of belonging to a group. In Singapore, the use of Singlish (otherwise known as “local Singapore English”) might be used to signal informality, camaraderie and membership to a local community. On the other end of the spectrum is a more standard form of English (“international Singapore English”), which, if spoken, could signify educational attainment, authority, and distance. Dr Gwee compares common Singlish phrases, what they appear to mean, and what they actually mean. Yet things are not that black-and-white, because most Singaporeans code-switch easily between local and international Singapore English, injecting fragments of Singlish and other languages into sentences otherwise grammatically correct under the auspices of standard English. This indeterminate position of Singlish as a language was a thread seamlessly picked up by poet and literary critic Dr Gwee Li Sui in his talk, “So Speak Singlish Good or Not?”. Dr Gwee convincingly argued that Singlish, contrary to popular belief, cannot simply be classified as a variety of English. Singlish is unique in that it is heavily dependent on many languages for its meaning. For example, the phrases “buay tahan” and “go and die lah” are both only understandable in Singlish — the former is a mishmash of Hokkien and Malay words that gives it the meaning of “intolerable”, and the latter is an exclamation to chase an annoying person away, rather than a literal command to commit suicide. Given this open-endedness, Singlish might appear indefinable. But not so — Dr Gwee, from years of accumulated experience in speaking and thinking reflexively about the language, distilled its distinctive traits into a neat list, explaining its delightful wit and nuanced grammar. Singlish is full of satirical banter and strange, humorous logic, as phrases like “ali baba” (“to steal, as if spiriting away”) and “blur like sotong” (“clueless, in a daze”) show. Perhaps more impressively, the use of end particles in Singlish is very complex, hinting at the speaker’s intended meaning by a combination of diction and intonation. “If they only know how to use ‘lah’, they’re probably angmoh,” joked Dr Gwee to uproars of laughter in the Performing Arts Centre. 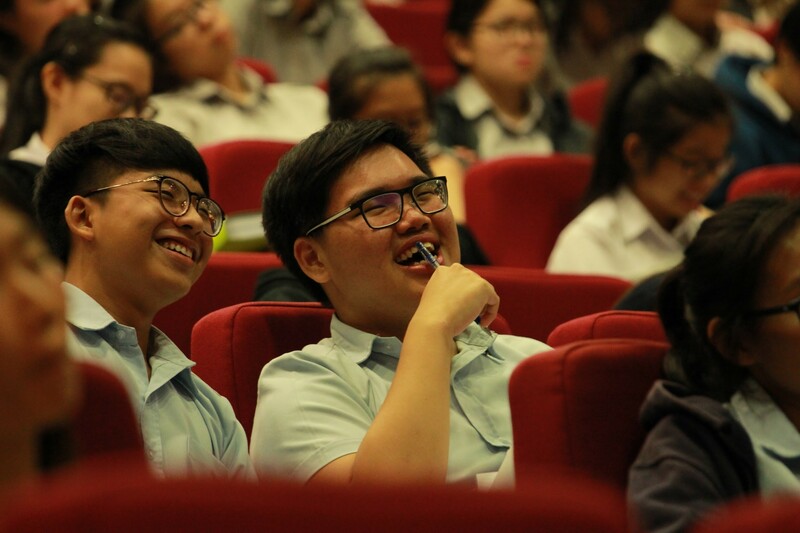 Students attempt to absorb Dr Gwee’s talk better by eating their words. The important thing, Dr Gwee concluded, was to treat English and Singlish as two differing specimens of language, in both of which we can overtly aim to enhance our competence. Indeed, Singlish is often treated in official governmental discourse as a corrupting influence, a mangled and ugly form of English, and in the words of the late Mr Lee Kuan Yew, “a handicap we must not wish on Singaporeans”. But Singlish deserves to be treated with its own dignity, to be celebrated as an integral part of what it means to be Singaporean: “No one’s English improves by speaking Singlish less, and no one’s English deteriorates by speaking Singlish more,” said Dr Gwee. While both Dr Tan and Dr Gwee’s presentations doubtless offered stimulating food for thought, there were mixed feelings on the ground with regard to Dr Tan’s talk. “Some of the stuff has been taught in our ELL curriculum, so it was a useful recap,” said Andrea Low (16A01A). Studies cited by Dr Tan, such as that of Labov and Trudgill, were also already familiar to much of the audience. While the presentation brought refreshing ideas to those less familiar with the academic theories presented, it still came across as rather dry and academic to the non-ELL students in the audience, as it focused mainly on theoretical frameworks. 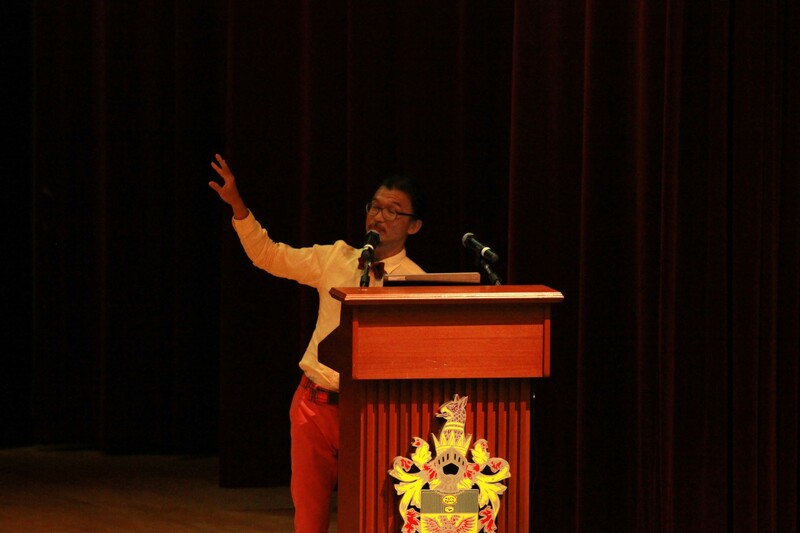 Nevertheless, Dr Tan provided a new angle from which to view stylistic choices in language usage. In contrast, the audience warmed more easily to Dr Gwee’s sharing, as he brought to bear a very personal examination of the quirks of Singlish. The immediate relatability of the presentation facilitated their appreciation of Dr Gwee’s points, delivered in a down-to-earth manner without losing their punch or panache. This time, while the points covered in the talk were somewhat less directly relevant to the ELL curriculum, the ELL students felt that they were able to get a better grasp of the development of language, specifically that of Singlish, through the talk which gave them useful concrete examples of the evolution of language over time. 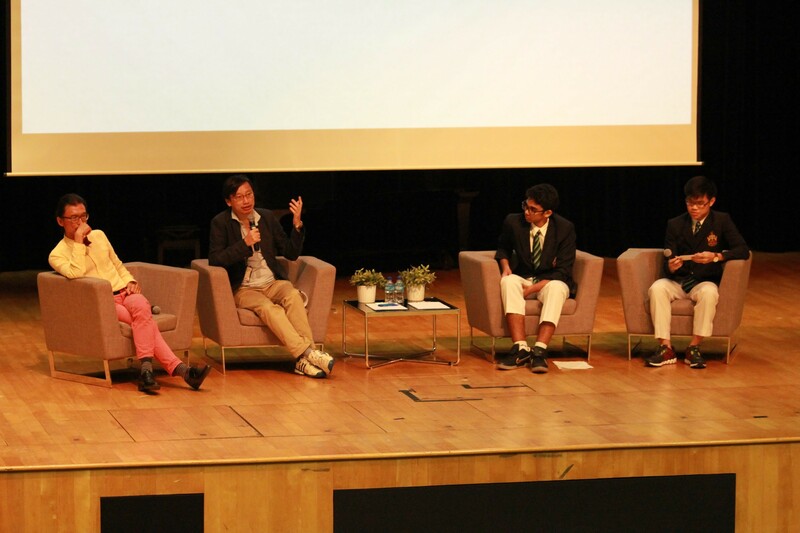 The Q&A segment that followed was dominated by questions about the nuances of Singlish’s creation and evolution. An especially perceptive commentator noted that Singlish contains very few Tamil words, compared to words from languages with a larger number of speakers, such as Malay and Hokkien. Dr Gwee replied to this by acknowledging the disparity in word origins, but also noted that this said less about potential discrimination within the language than about the demographic of its users. The most noteworthy moment arrived when a teacher from another school, seemingly courting controversy, interrupted a student’s question and commented that Dr Gwee’s talk was an apology for Singlish, which “three-quarters of the students here do not understand”. She raised the view, prevalent in Singapore, that Singlish downplays the importance of English. The auditorium, was visibly provoked into tremors of buzzing. Evidently, this was the very notion that Dr Gwee had aimed to challenge and subvert through his speech. Queried about this hastily conceived comment, Dr Gwee responded, “It’s a perspective. It’s the reason why Singlish was demonized for so long. It had its day in the sun. It didn’t work the way we wanted it to, so let’s take another route. I think it’s been proven that you can’t kill Singlish. Why still want to go down that path? I think it deserves a life that has been denied it for so long.” We think Dr Gwee hit the nail on the head: Singlish, in the context of language, has a life of its own, and can no longer be simply dismissed as a ‘bad’ offshoot of Standard English. 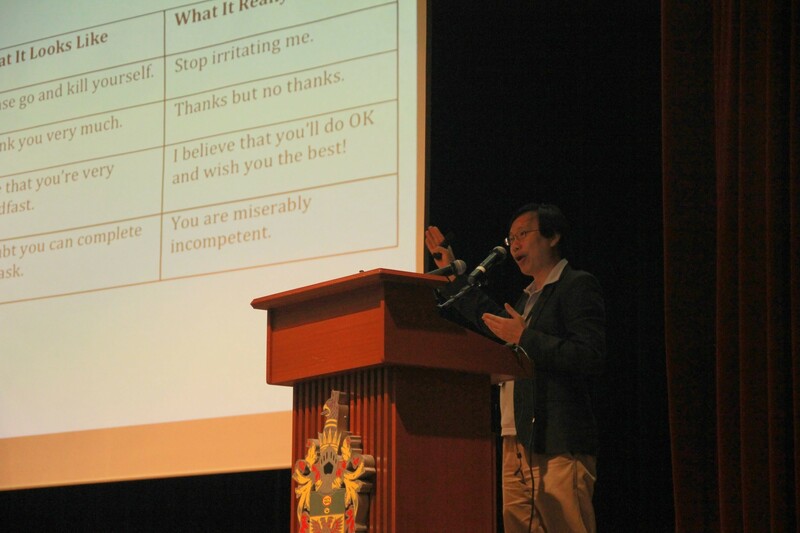 In a nutshell, Dr Tan hopes that his talk will make ELL students “a little bit more conscious of the things they say”, and realize that style is more than an issue of language, affecting the way we choose to behave and dress ourselves. For Dr Gwee, his wish is that students will “keep on speaking proper English but at the same time learn to enjoy Singlish”. “Language is a complex entity. Students should recognize that they are part of the life of the language, and whether it survives, whether it thrives or whether it ends, depends very much on the way they treat it … Language is very fluid, but it is also very easily damaged,” he said. Thus did the symposium end, and Dr Gwee wrapped up his talk with this message that spoke to all in the auditorium: to continue the study of ELL, to develop and maintain the awareness of our usage of the language, all “steady pom pee pee”.